A tailor-made solution to go beyond simple “sparklines” and yet dynamic. These in-cell charts help understand the data in a much better way and are easy to adapt. A different take at waterfall charts that is compatible with format of profit and loss statement adding visual cue for audience and users. This dynamic chart plots subtotals, income and expenses in different color. A “chart” made using conditional formatting to plot proportion and proportion of proportion. This way we get proportion of particular item in total and then plotting the sub-item that is taking the most out of it. This dynamic financial scenario analysis model recalculates the profit and loss statement based on the model selected and ALSO gives the comparative variance analysis of the selected model with other scenarios instantly side by side. Small business owners can easily harness the power of Excel to create Accounting records, however, making them dynamic so that you can generate accounting reports instantly requires advanced level skills. This model is done completely in Excel environment and helps you do accounting journals, create ledgers with powerful flexibility of dynamic chart of accounts. 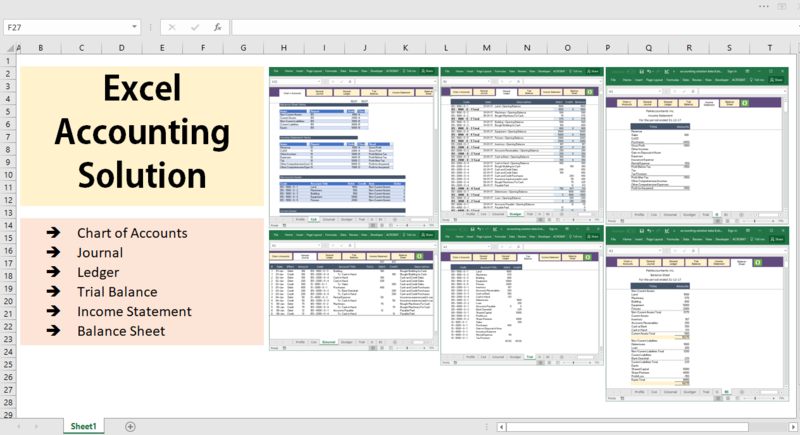 Complete bookkeeping solution done entirely within Excel and caters journals, ledgers, trial balance, balance sheet and income statement all within Excel and automatically. Simply enter accounts in Chart of accounts and update transactions in journal and rest of records will be updated automatically by pressing refresh button.